For anyone who thinks that the pay gap between men and women is something that doesn’t begin until later in their careers, or that this salary disparity is a disappearing relic of a bygone era, a new study claims that within one year of graduating from college, women are only earning 82% of what their male counterparts are making. The report, released today by the American Association of University Women, uses Dept. of Education data from a survey of 15,000 graduates of the class of 2009. 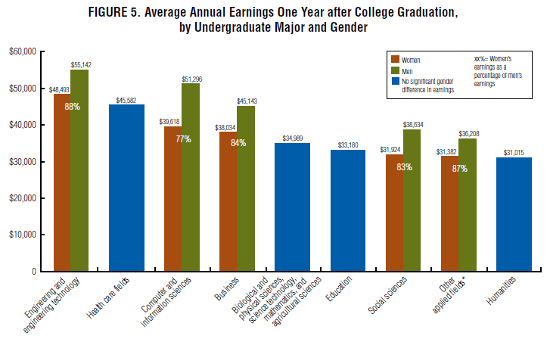 Within one year of graduating, males were averaging $42,918 while women only earned an average of $35,296. It didn’t really matter what type of school the graduates had attended, though the pay gap was the highest for people who had attended a private, nonprofit university, with women only earning 75% of the salaries earned by male graduates. Researchers also looked at nine different fields of undergraduate study and found that for five of the concentrations — Engineering, Computer & Information Sciences, Business, Social Sciences, and a cluster of applied fields like architecture, public administration, design, and others — the pay gap scaled almost in line with the national average. So though people with engineering degrees earned more than everyone else, women with engineering degrees still only earned an average of 88% of the men. Of the four fields of study with no significant difference in pay between the genders, — Healthcare, Education, Humanities, and a cluster of sciences, including biology, mathematics and agricultural sciences — two (Healthcare and Education) are fields where the classrooms are overwhelmingly populated (more than 80%) by female students. The study points out that the pay gap immediately puts women at a disadvantage for paying back student loans, which is already a $1 trillion problem in this country, regardless of gender. 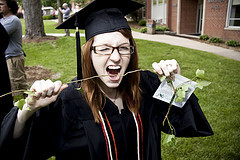 “Because women earn less than men do after college, student loan repayments make up a larger part of women’s earnings,” reads the report, which found that in 2009, among full-time workers repaying their loans one year after college graduation, 47% of women were paying more than 8% of their earnings toward student loan debt compared with 39% of men.